Who would have thought I had something in common with General de Gaulle? But I do. 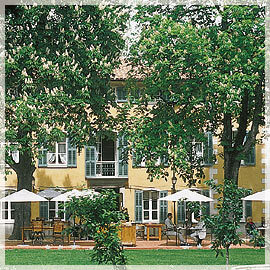 The great man loved the village of La Celle and its hotel. And now, so do I.
Forty miles south of Aix-en-Provence and only a ten minute drive from exit 35 of the A8 motorway, La Celle still manages to feel like the sort of isolated retreat from the cares of the world a busy statesman might need. I stopped the Royce in front of the wrought iron gates which dominate the tiny square. After a moment’s hesitation, they swung apart and the motor crunched onto the gravel in front of a handsome bourgeois house dating from the 18th century. Upstairs, I knew, was the room used by the General – the room for which a special bed had been constructed to accommodate his patrician length. The Hostellerie de l’Abbaye de la Celle has recently been restored by its new owners, the great chef Alain Ducasse and his friend Clément Bruno. I have to report that it is a truly lovely place in which to stay, with a glorious setting, very comfortable rooms and excellent food. It is also, in my judgement, offering hospitality which ranks among some of the best value in the whole of France. As is usual with enterprises connected with Monsieur Ducasse, all around there is a feeling of opulence and good taste; but the prices charged are startlingly modest. Take my own apartment, the Cedar-Tree room. Bed and breakfast for two was just under £150 a night. It was on the second floor without benefit of lift, but the stairs were wide and manageable, even for me. It was the cheapest of the ten rooms (the General’s old billet on the first floor attracts the top rate - £190), but did that mean it was poky and miserably furnished? Not at all. In fact, it was both spacious and stylish. From the private hallway (with wardrobes and a safe), a glass panelled door opened into a large white room, with the beds – crowned with a gilt-framed canopy – in a recess. Down five steps was the second hall, with the loo off to the left and the bright yellow and brown bathroom off to the right. Period pieces included a sofa, an armchair and a writing desk; equally useful were the up-to-the-minute fax machine and the (controllable) air conditioning units. But most to my taste was the cd player, which enabled me to enjoy the Mozart Requiem as I prepared for dinner. I always take care with my dress for the dining room. If others are going to go to a lot of trouble for me, I like to make a bit of an effort for them. It is my principle of reciprocity, and I commend it to the world. 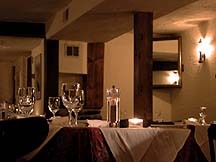 It is certainly worthwhile here, for – although the atmosphere is deliberately less formal than most of the restaurants I visit (the waiters, for example, wear orange waistcoats and – let me whisper it – open-necked white shirts) – there is no doubt that chef Benoît Witz intends his food to be taken seriously. And so it should be, because it is seriously good. Two dining rooms enable you to choose between the smokers and the abstainers. I tried both. Each is small, with tables of good size, comfortable armchairs and white tablecloths. The only discordant note is the canned music – Carmen, played loud enough to be audible but not loud enough to be enjoyed. Better turned off, I think. 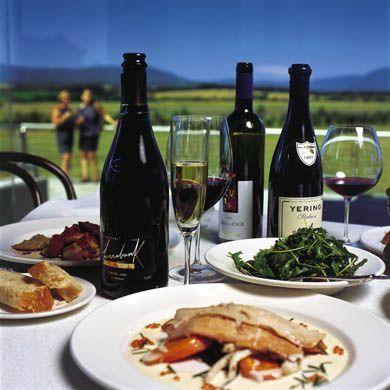 The wine list is moderate in both length and prices, with most offerings being in the £20 to £80 range. Local wines feature prominently, including some from the commune of La Celle itself – the 2000 white is £18. From the four bottles I tried, one startled me with its excellence. 1993 is not known as a particularly good vintage for red bordeaux, but the Lynch Bages (£85) was tremendous drinking – dense black fruit with a whiff of tobacco in the nose, in the mouth at first a bit unyielding but then gushing with soft, supple flavours, with a very long aftertaste and a delightful hint of residual sweetness. Wonderfully enjoyable. So, instead of thinking, I trundled 20 minutes up the road to view the glorious mediaeval basilica of St Maximin, built to house the re-discovered relics of St Mary Magdalene. As I entered and my eyes first lighted on the high gothic vaulting, a magical moment: the organ began to thunder out a Bach prelude. My wanderings in the countryside around La Celle afforded me many such pleasures, for this quiet (yet accessible) part of France is full of treasures. No wonder General de Gaulle liked La Celle. Now that its hotel has been so splendidly re-born, there can be few places better in which to recapture some peace and calm. Place du Général de Gaulle, 83170 La Celle, France.